"I think they were exemplary! I sure do. Really you can sum it up in very few words, and that is that they do what they say they will do....I have met an awful lot of people in my life and done quite a few deals, and Jerry is one of the very few people that lives like I have lived for many years, and that is, my hand shake has been my bond, and he is one of few people I've met I think that kind of feels the same way. I cannot speak highly enough of him, for one thing, there are very few people, not only today, but ever I guess, where you can believe what they tell you....and he has done everything he has said he would do and I applaud him for that." 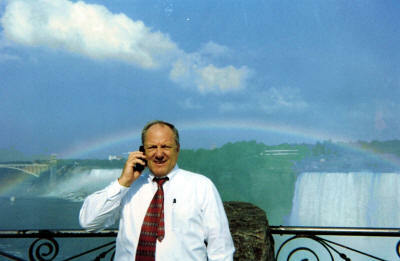 Jerry overlooking Niagara Falls while attending the closing of Buffalo Oxygen. At the end of the first year with the company that adopted my baby (my oxygen company) and myself, I realized I owe you a grateful "thank you"! As a small, but proud owner of a DME company, it was very difficult for me to want to see the inevitable writing on the wall. Jerry, you were compassionate to understand my feelings and could look ahead without extreme bias. You looked for a proper placement in the best interest of me. (The Buyer that you introduced me to has been absolutely wonderful to work for, and in their terms to work with. I do not believe that this could have been a better match. Again, thank you Jerry and Baker & Associates for standing in my corner and being my agent that picked the winning team for me. It has truly been a job well done. Thank-you for all your help and understanding. You helped make this as tolerable a process as possible and I know you ran interference and smoothed things out so that we were not discouraged or upset. You performed a thankless task and performed above my expectations. I want to thank you for your assistance with the merger of our company. I learned over the several months of negotiating to trust your judgment with the difficult issues that often arise in these kinds of deals. I found you to be very genuine in understanding what exactly I wanted to accomplish; never compromising my position or my feelings throughout the negotiations. Had you not understood the acquiring company, it is possible that this merger would not have taken place. It is not often that you get to hit a home run in the business world. As an owner you often wonder how and when you will be able to profit from all the years of hard work. Your firm made it possible now and laid the ground work for future rewards. Again, I cannot thank you enough. If I can help you in any way, please feel free to call. "I found Jerry to be very professional and efficient in handling this transaction. He listened to my concerns and what I wanted for my business, and what I was looking for in a buyer. I felt he had a balanced interest in both the buyer and the seller when handling any transaction. He understood my concerns both financially and the organizational direction I wanted my company and this sale to take. He met my needs and put me in touch with a compatible buyer which led to an expeditious and satisfactory close of sale of CPO2, Inc."
I would highly recommend Baker & Associates to anyone who is considering marketing their company for sale." 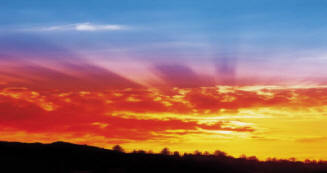 "Baker & Associates, Inc. was instrumental in arranging a strategic business partner not once-but twice! Both deals were good arrangements for all parties. It is a pleasure to have had the opportunity to work with B&A on two separate occasions." "Though our initial encounter was purely business oriented, I quickly learned to appreciate the way B&A conducted the acquisition negotiations. B&A's conduct was always ethical and efficient, and their input was most valuable. They did all this while maintaining a warm personal contact." "In 1996, with so many changes in our industry, we decided to sell our business and contracted with Baker & Associates to handle the sale. Jerry Baker and his associates were always very professional and prompt in handling our sale. In record time, they marketed and sold our company. Baker & Associates did an excellent job of marketing our business, their knowledge of the healthcare field was invaluable. They worked hard and provided us with business advice and support throughout the selling process. I would highly recommend Baker & Associates to anyone considering the sale of their business." "During the summer of 1996, we decided to contract with Baker & Associates to accommodate a possible merger or sale of our business. Within a couple of weeks, we were already looking at an offer which was satisfactory. Baker & Associates literally did everything they promised. They provided answers to every question and concern that came up in a timely manner. Baker & Associates made this experience very pleasant and provided moral support through the challenges that can arise in these situations. I would strongly recommend Baker & Associates to anyone considering contracting with a broker for the sale or merger of their business. These people knew exactly what to do in every instance. Selling a business that is your life is a very difficult and emotional decision. Choosing someone to represent your views and desires is the single most important choice an owner will make in the sale process. We chose Baker & Associates because of their integrity and honest way of doing business. The representation of HRC was professional and honest. We could not be happier with the results. I want to thank you and your staff for all that you have done on my behalf. It has been a unique pleasure getting to know you all. I have the utmost confidence in the quality of your work and character with which you do your job. The process of selling a family business is intellectual and emotional. While I may be ready for the intellectual task, I am no longer ready to be emotionally involved in entertaining the idea of selling. I know you all respect my character and commitment, so I know you will respect this decision. Jerry, you and your staff represented yourselves honestly and with integrity throughout this process. You always represented yourself accurately and never made a promise you didn't keep. You have certainly earned my trust. I appreciate our friendship and look forward to maintaining our relationship. If I change my mind about selling my business, I will let you know. Thank you for your services regarding the sale of our medical supply company. We enjoyed working with all of you and really appreciated all of your expertise during the transaction. We would recommend your services to anyone interested in selling their business. Professional accomplishment is not the result of a single day's work. Carefully considered actions build upon one another until the goal is achieved. Look at any successful acquisition and it will be evident that it did not get there alone. Jerry Baker & Associates diligence and professionalism have reassured us that there are other people like us that fulfill their promises. The extra effort, patience and time you willingly dedicate to ensuring the accuracy and completeness of our acquisitions does not go unnoticed. You were such an instrumental part of our success. Please know that your dedication and hard work are appreciated and we look forward to our next opportunity to work together. I want to thank you for all the time you put into finding the right buyer for our business. The assistance of your staff made for an easy transaction. It was a pleasure to do business with such a professional group. On behalf of myself and Chuck Durand, I thank you for the splendid job you did arranging the sale of our company, Durand’s Rent- All. If we are ever in a position to sell another business in the future, you will be the first to know. A belated thank you to you and your staff for the outstanding job that you did which resulted in the sale of our business to Apria Healthcare. Needless to say, I was shocked by the efforts that your associates did to get the price that we did for our business. After receiving offers from other companies I never thought that we would get the price that we finally received. I remember a conversation that I had with your staff members when he told me to be patient. Unfortunately patience is not one of my strong assets. Needless to say that he was right. I will be anxious next month when we are supposed receive our final check for $50,000. Again many thanks to your staff for a job well done.